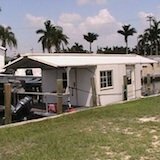 Three times in our lives, my husband Mike and I have made our residence together in a semi-tractor trailer. For nearly three years, we drove as a husband and wife professional truck driving team. For many years since then, Mike has driven solo, two times during which I have ridden with him as his in-truck "home support team." There are millions of truck drivers worldwide; most of them are men, some drive as a team, and some have jobs that are strictly local in nature. 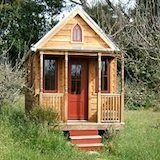 I will address the tiny house living issues faced only by over-the-road (OTR) drivers. 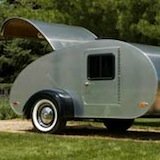 Living in a truck is like living in an ultra-small apartment on wheels, but with some significant differences. All of the trucks I have lived in have had a sleeper berth area and at least some storage room in which to store clothes, toiletries, food, and meal preparation items. The photo at left shows storage areas in one of our trucks with numbers near specific items being stored. Items range from food (5) to our portable toilet (8) to meal preparation appliances (2, 3 and 6). Items 1-5 are stored under the lower bunk, which is in its up position in the photo. Unlike recreational living in a recreational vehicle (RV), living in a commercial motor vehicle (CMV) requires at least one of the occupants to drive professionally. For this reason, at least some space in the truck must be reserved for tools and equipment used in connection with one's job. Some truck drivers choose -- or are required by their companies -- to stay out on the road away from home for days, weeks or months at a time. Advanced planning is needed to be prepared for as many potential scenarios as possible (such as needing clothing for different climates), all the while bearing in mind that there is a very limited amount of storage space in the truck. 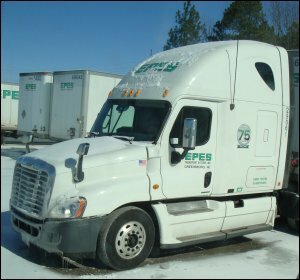 Some professional drivers who own their own trucks (owner-operators) have custom sleeper berths that include showers, toilets, kitchens and even enough living space for furniture. Customized semis tend to be very expensive -- as much as a residential home. Mike and I have never owned the trucks we have driven; all of our professional driving experience has been as "company drivers," driving "company trucks" owned by a trucking company. Our in-truck living situations have been limited by the companies' truck specifications and their restrictions on what drivers may take with them. The Conveniences of Home in a Semi-Tractor Truck? 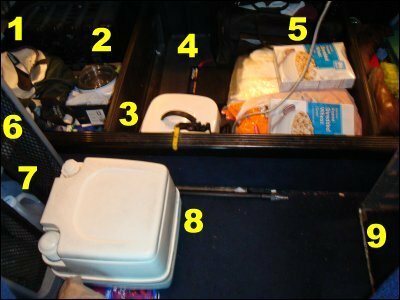 Just like we expect certain conveniences at home, many truckers have come to expect certain functionality in their trucks. 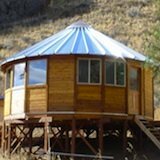 For that reason, we have become very creative in learning how to make the most of the tiny living conditions in our homes-on-wheels, especially with a view toward saving money. A professional driver's priorities will shape what he packs and how he lives in his truck. 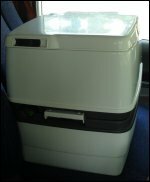 From the very first trip that Mike and I took as a truck driving team, we had two essential items with us: a device to keep perishable food cold and a portable toilet. We struggled to find a satisfactory method of cooking in the truck until we obtained a device to provide electrification in a form we were used to using. Some trucking companies prohibit their drivers from having a portable toilet or using any electrification device in their trucks. Others allow one but not the other. Still others allow both but restrict the amount of power that can be drawn through electrification products. We've tried a number of food preservation methods including dorm-sized compact refrigerators, thermoelectric coolers and ice chests. For us, using an ice chest is the most reliable method of keeping food cold. Of course, the ice chest requires a continual supply of ice, but we found a way to take care of that. By using an ice chest, we don't have to worry about refrigerator compressors conking out or thermoelectric cooler motors going bad. From both hygiene and convenience standpoints, having an in-truck "bathroom" is far superior to relying on private or public restrooms (if they are even available). Our portable toilet serves double duty in the truck by also being the collection point for waste water from cooking and cleaning. The water we use in the course of brushing our teeth, boiling foods and cleaning dishes goes here, too. The model of portable toilet we most recently upgraded to has one of the largest waste holding tanks available. The successful portable toilet user will endeavor to keep the fresh water tank charged, use some kind of additive to break down the waste and control odors, and empty the waste holding tank when required. The contents from the waste holding tank can be flushed down a standard toilet. Just as we are used to having electricity in our homes, so many drivers want or need to have electricity in their trucks. The challenge is that electrically-powered devices used in homes run off AC (alternating current) power whereas many trucks come equipped with only 12-volt DC (direct current) outlets. There are two popular ways to provide in-truck electricity: either use a diesel-powered auxiliary power unit (APU) or use an inverter. APUs cost thousands of dollars and must be installed so as to use diesel. Inverters can cost much less. For drivers who do not have an APU, inverters are the way to have reliable AC electricity in their trucks. Some inverters plug directly into a cigarette lighter, but the power that can be drawn from them can deliver at most about 175 watts. This is good enough to power many crock pots, but not other power-hungry appliances. truck support items (rechargeable flashlight, etc.). 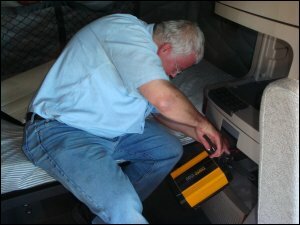 If a battery-connected inverter is used when the truck's engine is off, the power can theoretically be drawn down to a critical level. 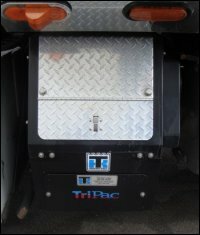 Some newer model trucks conserve enough power to allow the truck to be cranked but shut off power to lights, 12-volt outlets or the inverter when the power level is critical. To recharge the batteries, the driver must either drive or idle the engine. 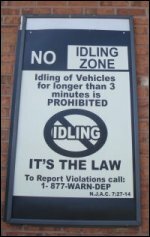 In a growing number of locations, anti-idle laws are being passed to prevent drivers of semi-tractor trailers from idling. So you can see from just an electrification standpoint, having an APU is better than having an inverter. Many of us are accustomed to having thermostats in our homes and workplaces set at temperatures to keep us comfortable year-round. We may take for granted staying warm in the winter or cool in the summer. 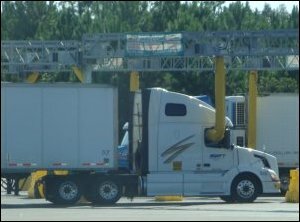 Mike Joyce, legislative affairs director for the Owner Operators Independent Drivers Association (OOIDA), once remarked regarding truckers' ability to rest, "When it's 100 degrees outside, it's 120 degrees in their truck." idle anyway and take the risk of getting a ticket. When you have a land-based home and a personal vehicle, you don't often think about the challenges of going shopping because there usually aren't any. Well, for a truck driver on the road, his truck is both his home and his only vehicular mode of transportation. Because large trucks cannot be driven and parked just anywhere, shopping from one can be a truly challenging experience. Sure, truck stops and travel centers cater to travelers, but the prices of products and services at these businesses can be much higher than one can find in other stores. And frankly, you can't buy a wide variety of products at a truck stop -- particularly food. For food and other general commodities, one needs to go to a regular grocery store or department store. Unfortunately, many stores or their locations are not truck-friendly. (In fact, some of them have clearly posted signs that "No Trucks" are permitted in their lots or that trucks will be towed away.) The wise trucker will carefully plan his/her route and stopping places to stay legal. We are convinced that one of the biggest expenses for company drivers is food. It is very expensive to eat nothing but restaurant food. 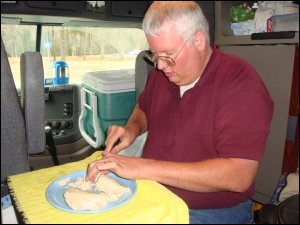 Mike and I have saved a lot of money by preparing, cooking and eating food in the truck. 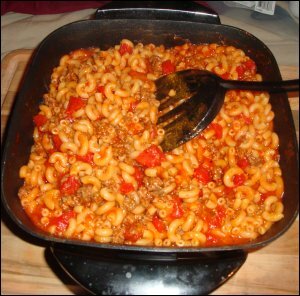 Of course, we occasionally eat out, but for the most part, we eat meals we fix ourselves. For that reason, a significant part of our tiny living space is devoted to meals: food (storage for both perishable and non-perishable items), dishes, utensils, cooking appliances and cleaning equipment. In the trucks we have driven, we can do just about anything that someone can do in a house except take showers, machine-launder laundry, and accomplish tasks requiring lots of space. It is definitely an adventure to live in the small space inside a semi-tractor trailer truck, especially for two people. However, it is a lifestyle chosen by millions of over-the-road truckers around the world. For these hard-working men and women, we dedicate ourselves to providing truck drivers money saving tips. Copyright © 2011. All Rights Reserved. NKBJ InfoNet, LLC. Printed on Tiny-House-Living.com with permission.